Headlines Fishing has been fantastic again over the past week with mild conditions and plenty of fish around. We have had some fo the best fishing for the whole season over the past week with all methods producing. Now is the time to be here if you can! We have had plenty of reports from the streams and all have been good. 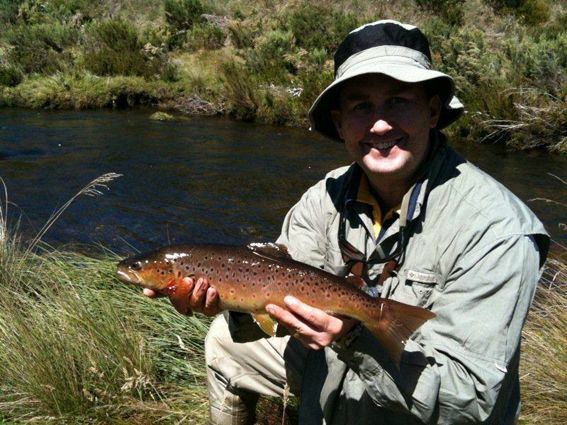 *Kieran had some fun on the Euc and got this great coloured brown on the weekend. Fish was weighed in the net, before release and went 1.8kg. *Dan Williams got this pretty fish on the weekend and as you can see water levels are fantastic at present. We have had multiple reports of 10 plus fish sessions from individual anglers in the last few days and while not all fish are large there is plenty to have some fun with, especially if you use a lighter rod like a 4 wt. Mudeyes, ants, termites, hoppers and beetles have have made up a the majority of fish stomach contents. *Kieran O'Shannassy and Simon Lim caught 20 fish between them on friday night on mudeye style patterns and wooly buggers. *Mick Couvee managed nine fish on the same night in a different part of the lake. A foam mudeye/damsel pattern worked a treat. *Fished after work Monday and only caught one before dark, though I saw plenty moving. Tied on a muddler as the light vanished and caught nine fish in fifteen casts! Third best individual session I have had this season as far as numbers go. Lake Jindabyne:- Jindabyne reports have been quiet over the past week. But should have cooled enough to be doing similar things as Eucumbene with the mudeyes. Fish quality has been better in Jindabyne but they can be a little harder to catch. Several reports of double bags being caught in a session have come through with flatline tassies in y82, Holographic and Y94 being real killers. One angler passed throug the shop to pick up a couple of lures at around 10am on Sunday. He headed out to Middilingbank and trolled out of his kayak. He was back at the store around 4:30pm and had caught ten fish. That is fantastic session. Holographic tassies were THE lure. Jindabyne:- Some great quality rainbows with fish over the kilo mark have been getting caught by those using two to three colours of leadcore.